Vagueira Beach Guest Surf House - Aveiro, Porto Guests overall rating: ☆☆☆☆☆ 0 based on 0 reviews. 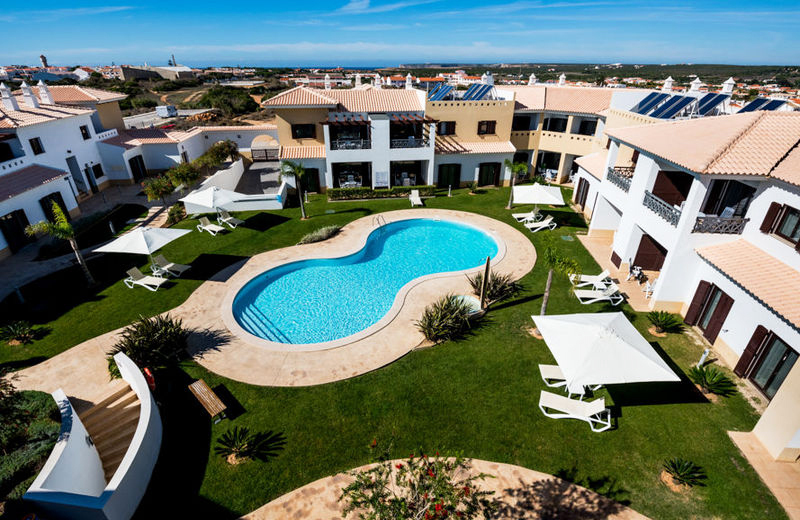 Vagueira Beach Guest House is located in the center of Portugal, 10 minutes from Aveiro and 40 minutes from Porto and has many restaurants, beach bars and shops where you can easily buy souvenirs and necessities. This beach has the best conditions to learn how to surf and awesome waves for advanced surfers. 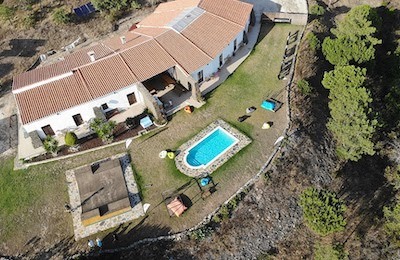 Surrounded by a beautiful landscape our Guest House is 100 meters from the beach. It has 2 double room (2/3 persons) with private bathroom, 1 Twin room (2/3 persons) and 1 dormitory with bathroom for 6/7 people. A living room with Tv, an equipped kitchen where you can prepare your meals, a small surf shop, a terrace to chill and an outside garden to relax after a surf session. The daily breakfast is included in your stay. This village is surrounded by salt water, with the sea on one side and the other the Ria de Aveiro, looking like you are on an island. The Ria offers excellent conditions for Kayak tours and Stand Up Paddle, kite surfing and wakeboarding. It also has a route where we can see migratory or local birds, as well as other animals. White Sandy beaches awesome to enjoy the sun or learn how to surf with our team of Certified Surf and SUP Instructors. Advanced surfers will not regret to visit this empty surf spot paradise. You can use your free time to visit the traditional fish market and Arte-Xávega which is an ancestral form of fishing used on our coast. You can visit some works of contemporary art as well. 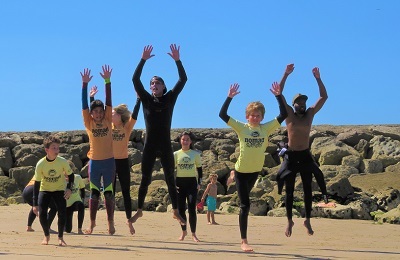 Our Surf camp is open all year, but the best surf season start in March and finish end of November. We welcome everyone from experts surfers to beginners, families, groups of friends, and don’t forget your best friend (cat or dog). Living room with tv, couch, big table and chairs. Our staff will receive you in the best way and will be available to assist you whenever necessary. 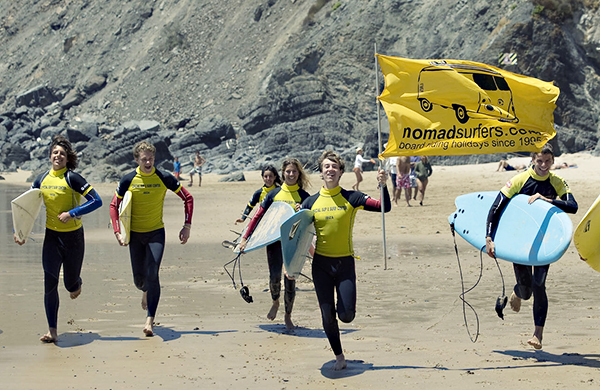 We give surf lessons every day, all year round, no matter what age. Classes have a minimum duration of 2 hours and include all gear, neoprene wetsuit, board and accompaniment by certified instructors. The ratio is 5/6 students for each instructor. The surfing lessons take place on the beach just in front of the house. After surfing lesson you can rent all the gear to continue improving your surf. We have facilities on the beach that allows you to pack the material and shower after class. You also can have photos from your surf session and video analyse. Our Instructors speak English, Spanish, Portuguese and some of them also speak French. Certified instructors with knowledge in tourism, they will do everything to provide a great stay in our company. During the winter months (December to February) the waves are not so constant due to changes in the weather and the sea. The water is colder and the ripple is always a bit stronger, ideal for the more advanced levels. However, there are always places where initiation classes take place safely and ideally for learning and improvement. From April to November, the weather starts to improve and the sunny days come to stay. The water begins to warm up and the waves begin to become more constant. Perfect for all levels. Classes are scheduled according to the state of the sea and the weather as well as the level of each one. SUP tours: Tours duration are 2 hours and include all gear, neoprene wetsuit (if necessary), board and accompaniment by certified instructors. Vagueira is located in the center of Portugal, in Aveiro region, 10 minutes from Aveiro city center and 40 minutes from Porto and has many restaurants, beach bars and shops where you can easily buy souvenirs and necessities. You also have Pharmacy, petrol stations, supermarket, a lot of good restaurants. Surrounded by a beautiful landscape our Guest House is 100 meters from the beach, and 50 meters from the river. With car, you can visit Porto city (40 minutes), Coimbra city (40 minutes) or our beautiful landscape of Sever Do Vouga (30 minutes). If you arrive by plane to Sá Carneiro Airport (OPORTO), you can easily take the metro to the city center. Arriving at the train station of campanhã you will catch the train to the city of Aveiro. Arriving at Aveiro City we offer you a Free Shuttle during the day (9h to 21h). *extra nights or week we offer you 10% discount. Free access to the living room, kitchen, garden, etc..
Free transfer from Aveiro during the day (9h to 21h). At night this shuttle coast 25 €/person. Arriving at Aveiro City we offer you a Free Shuttle during the day (9h to 21h). At night this shuttle coast 25 €/person.